Based on Mumbai’s world famous film industry, Bollywood Story is a 5 reel, 9 payline video slot powered by Net Entertainment. This Indian-themed picture comes with a bonus feature that awards up to 60 free spins as well as multiple floating wilds that hit on every spin. Say “action” from between 9p and £90 per spin. As you’d hope given the movie theme, Bollywood Story is a visual treat – the action centres on the members of an Indian family and the setting is their lavish home. Symbols on show include lower value playing cards from A to 9 as well as father, mother, son and daughter. The Bollywood Story logo is the top payer, getting you 1,000 coins if you land 5 on a payline. You’ll notice that a number of flower garlands float onto the reels on each spin. These are floating wilds and turn the symbol on which they land into a wild. In the base game, between 2 and 4 of these will hit on each spin. This is known as the Floating Wild feature. 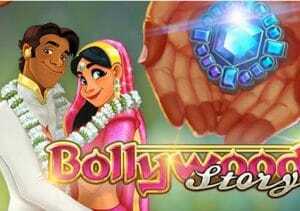 Bollywood Story also comes with a Free Spins feature which is triggered by landing the blue gemstone scatter – 3, 4 or 5 of these anywhere on the reels will get you 10, 20 or 30 free spins. You can add to this haul if the scatters land during the feature giving you a potential 60 free spins in total. The floating wilds are in play during the free spins too. Better still is the fact that the number of wilds increase with between 3 and 6 of then added to the reels on each free spin! The variance in Bollywood Story is in the medium range. The floating wilds can be a bit hit and miss but if you land the full complement of 6 in the free spins in a nice combination, it’s possible to hit some spectacular payouts – there are maximum wins of up to 500 times your stake on each spin. Superbly designed and a with a catchy soundtrack, Bollywood Story is an entertaining game to play – the features may be basic but there’s still plenty of winning opportunities on offer which makes Bollywood Story more of a box office hit rather than a critical turkey. I also recommend you try the excellent Böb: The Epic Viking Quest for the Sword of Tullemutt.